We are available 24 hours a day, 7 days a week for servicing to laundry exhaust systems. Found in commercial laundries which can be a part of a hotel complex or a factory. Of all air handling systems, laundries are the most fire hazardous. This is because they pick up lint and fluff via the large driers. It is recommended that these systems are cleaned at least every 4 - 6 months to prevent the risk of fire and the risk of costly blockages. After reading the preceding paragraph you can see fires are common in such exhaust systems. If your exhaust system extracts hazardous substances such as fluff the risk of fire is increased. Only you can estimate the cost to your company of a fire, to say nothing of the risk to customers or staff. Depending on the material being exhausted, the system can be an absolute breeding ground for vermin and other nasties, such as unpleasant odors. The grilles can become blocked, causing suspicious particles to drop on unsuspecting staff or customers. Blockages in these systems are common. 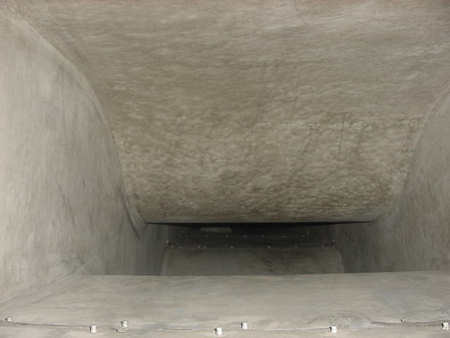 Over a period of time the material being exhausted can build up in the duct. 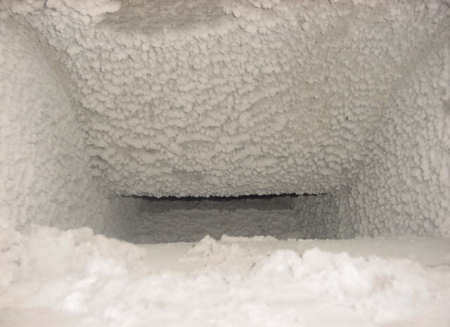 Even though the fan works harder, it is not as efficient and the blockage becomes worse. Unfortunately, in most cases the fan will break down causing major problems. A simple regular cleaning program will eliminate this problem. Not only will the system be cleaned but you will be kept informed of any problems that may be occurring in the system so that they can be addressed before any costly repairs or loss of time. Please don't hesitate to contact us in regards to the Australian Standard Requirements that deal directly with your system/s. We have gone to great lengths to source the current Australian Standards and have included those paragraphs in an easy to read letter format saving you hours of time and research. A service agreement offers you the security of knowing that the quoted price will remain fixed for the term of the agreement and that the program will be carried out by a trusted company who has prior experience of the job involved. Samples of before and after photos can be seen below. As you can see they provide excellent feedback and conclusive evidence of the job performed. Don't forgot that new to our website is online reporting in a client only access area. Our service report can be completed on site giving you the most up to date information about the condition of your general exhaust system/s. Our service personnel can recommend a suitable program on the report based on the condition of the system which you can then program as a regular service. Upon request a Certificate of Compliance will be sent directly to you or made available in our new website client only access area. Along with your invoice, these Certificates are a vital record of the work you have requested to be carried out on your general exhaust system.